I don’t want to be drawn into the personal attacks that I have criticized others for getting into, so I’ll try to keep this to a few substantive points that I should probably correct for the record. On the advocacy aspect of this project I am interviewing both former and current members of the U.S. based movements as well as advocates outside the U.S., critics and commentators. On the policy aspect I am speaking with members of the Arab League and African Union as much as I am to the US Government or UN. However many of my interviews are off the record or done under certain conditions of confidentiality. As such, I’m not talking about them on my website. 2. SDAC says I am a “cheerleader” for the SD movement. The point of this research is provide the basis for assessing if/when advocacy has had a positive/ negative/ non- impact on policymakers and on the ground (these two things not always being the same). I can already tell the book will be plenty critical – but the focus will be on actions, and not on personal attacks. The SDAC post does take me to the question of how viable this attempt I am making at a comparatively transparent model of book research actually is. Pre net generation, this research would have been done without anyone external knowing anything about the process. The ease of blogging means that a more open process is possible, and that possibility was interesting to me. This website is an experiment to see if it can work. But it comes with challenges. One of them is of course the confidentiality issue. Thus there is a whole aspect of what I’m doing that will not be seen until the book actually comes out. On the plus side though, the website means that SDAC and others can criticize me as I go and, to the extent it’s constructive, this will make for a better book. I may ultimately decide that as a model, this whole idea of trying to let the outside world in a bit on this process is simply flawed, but for the moment I think I will keep persisting. 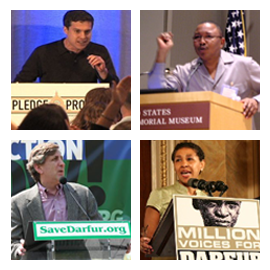 The mysterious folks at SDAC have mistakenly identified the Darfur movement as a centralized, hierarchical movement at the top of which sits organizations such as the Save Darfur Coalition (SDC). In fact, it is a decentralized, community-based movement. I guess it’s easier for SDAC and other critics like Prof. Mamdani to focus on the movement’s most visible feature. If these critics understood that what drives the movement is small groups of activists in hundreds of local communities it may be more difficult for them to focus their anger on a particular target. It’s difficult for governments to derail community-based movements because they are diffuse by nature. Activism is a part of people’s everyday lives. If SDC was to fold up shop today, the movement would continue. It’s energy comes from compassion, which leads people to a consciousness of our interdependence and mutual responsibility to one another. The ethical practice of compassion cannot be contained by a bureaucracy or organization. It’s a living thing. A way of life. An orientation toward the world. The Darfur movement gives me hope, not because there are well-funded organizations working within it, but because there is every kind of person you can imagine making it work.